How to become more organized is achievable and can help you accomplish more with each day. It can free up time to spend with friends and family. It can allow you to manage your day in a new way, which allows you to plan effectively; you might even find you have accomplished more but with fewer items on a to-do list. Becoming more organized is possible with time and practice but most importantly forgiveness, allowing for those days when your life isn’t perfectly organized; we are all allowed those days. Knowing what you need to do and how to organize your time can seem like an uphill challenge, one that you feel that you will never accomplish. However, many people get put off because if they can’t get perfection why try? It is important to try, no, it is never going to be perfect but that isn’t going to matter. Don’t compare yourself to others who you think are more organized than you, they might have struggles too. It is about knowing the tasks that need doing and when. This is the secret of being organized, knowing your daily tasks, your future goals and most importantly knowing your limitations. Only then will you succeed in running a great home and an organized life. Forgiveness is important; there is no point in allowing the negative to creep into your mind. If something doesn’t go to plan, don’t put yourself down, learn from these mistakes and move forward. Learning to forgive your imperfections will allow you to grow as a person. Perfection doesn’t happen very often and striving for the perfect home and life will ultimately drive you mad. It doesn’t matter if you can’t see beyond the basics and you are living in relative harmony, if it works for you, that is what is important. If routines are slipping then you might need to consider changing them. You might have adjusted your day and this could have an effect on what is the best time to fit your tasks into your day. Changing them slowly might make more sense, than just leaving them and allowing annoyance to build because tasks left uncompleted. Know if you need to be out by a certain time, and include it into your schedule. If you are not a morning person then you might leave most of your tasks to a time of the day when you are more motivated to complete them. However, what is important is not to have a list that is too long, that you could never complete. 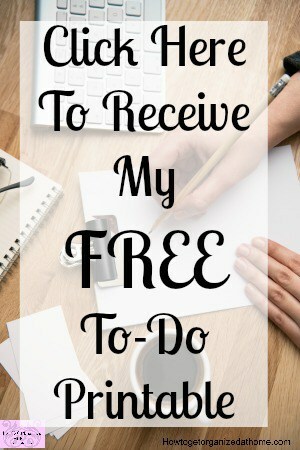 This will make you annoyed that tasks are not getting done; try only having about five or six tasks per day, if you can complete more and only when you have completed your list should you add one or two more jobs from your master to-do list. Becoming organized can free up more time, you’ll not be rushing around because you’ll be prepared in advance. This can make your life seem less stressful. 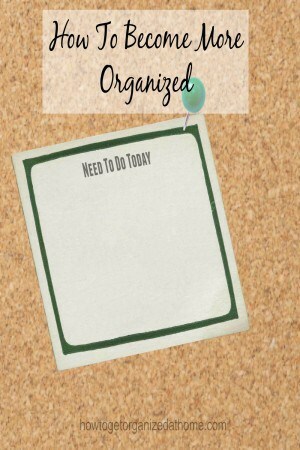 Becoming more organized is achievable and you might just accomplish more.